I’ve come pretty late to the arena of Podcasts. For ages I’ve heard people rave about some murder documentary podcast, or a ‘fascinating exploration of child slavery in Brazil’ podcast, but they’ve never appealed to me. Life is tough enough – I’m barely coping with the horrors of Sports Direct – so I want entertainment from my podcasts, not intellectual stimulation. I love Podcasts. When not at work I listen to them whilst folding laundry, at the gym, driving back from the school run or mucking out the children’s bedrooms. It is essential they make me laugh, or at the very least they have to be interesting, or involve writers or personalities I like. I thought I’d put together a list of ones I particularly love and have kept listening to over the years. It would be great to hear any suggestions you have so I can extend my repertoire. These podcasts are brilliant. I have lost count of the number of times I have snorted coffee out of my nose listening to them. They often leave me helpless with laughter, not a good look when you’re trying to impress the iron bodies at the gym. I’m not sure what it is that makes this podcast so unmissable. Buxton has a warm, self-deprecating sense of humour which I like, and because he is around the same age as me his cultural references are ones with which I am very familiar. He also has a lovely deep chuckle which never fails to make me smile when I hear it. His subject matter is wide-ranging. He talks about mortality and the death of his father so movingly he has made me cry. His passion for movies and music is inspiring, and he has introduced me to new artists and directors. This is against a backdrop of bonkers jingles, chats about his family and the weather. Embarrassingly, I now think of him as a mate I know very well so I can’t ever meet him because it would be incredibly awkward (for him). Each podcast features an interview, sometimes with someone very famous but it could be a singer from a band you’ve never heard of. The interview is bracketed by Buxton (or Dr Buckles as he sometimes calls himself) waffling on, often as he takes his dog Rosie for a walk. On one memorable occasion he recorded Rosie galloping past like a horse which, of course, reminded me of my own Dog, who does the same thing. I pretty much adore him just because of the bits when he has chats with his dog who turns out to be very wise and slightly scathing in his responses to Adam. I am aware that this sounds a bit bonkers but trust me, it’s great. I think my absolute favourites interviews are those with Louis Theroux and Joe Cornish who are regular contributors. Look out for those. Otherwise, I have linked below the episodes I particularly enjoyed and have listened to more than once. Let me know what you think if you give him a try. Adam and: Simon Pegg – the connection between the two of them comes across really well. I loved ‘Spaced’ and ‘Hot Fuzz’ and was pleased to hear how down-to-earth, natural and funny Pegg was in this podcast. Adam and: Louis Theroux – Old mates from school the ease of the chat is lovely, I feel like I’m sitting behind them in a pub eavesdropping whilst I get more and more drunk. Wonderful stuff. Listen to all of the ones featuring Louis. This one covers Theroux’s documentary on polyamory in America and caused a number of nose snorting laughs. Adam and: Charlie Brooker – I ADORE Charlie Brooker and have done since the old days when he wrote his ScreenBurn column for the Guardian. This interview didn’t disappoint. Brooker is irreverent, sweary, full of middle-age rage (which I can SO connect with) and very sharp insights into modern culture. Buxton brings out the best in him. Adam and: Joe Cornish – Whenever Adam interviews Joe it’s a joy to listen to. I think it was last Christmas when they talk about going to extreme cinema as teenagers and I had to stop doing press ups and leave the gym to go into the loo as I was sobbing with laughter. Really, really funny. Adam and: Romesh Ranganathan – Romesh is a very, very funny man. His discussion of the racial stereotyping of shows I remember from the 70’s and 80’s was thought provoking, and his stuff about his mum had me in stitches. Adam and: Kathy Burke – As you would expect, very sweary but utterly utterly brilliant. I loved this one and listened to it a number of times as I kept laughing through it and missing bits. I am going to have to stop there as looking through the site there are so many I could link to. Do have a look next time you have a long journey or mindless housework to do Brilliant stuff. I really recommend this as it’s so easy to get stuck in your ways and only listen to a limited bracket of comedians with whom you are already familiar. 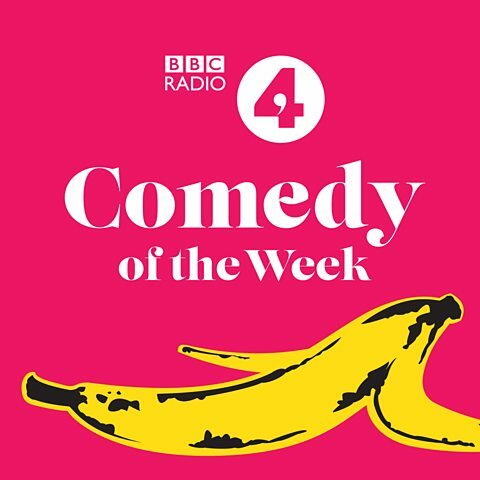 Every week the BBC puts out a collection of different pieces from all kinds of comedians from old established ones such as Mark Steele, to up and coming young comedians which include real diversity and loads of woman – such as the fabulous Josie Long and Sindhu Vee. I’m only a couple of episodes into this but I am already gripped. Really interesting and told in Fry’s gorgeous mellow, chocolaty tones. I find myself hypnotised and forget what I’m doing as I get caught up in learning about things like glasses were invented when the first printing press came out so people could read the small print. There is wit and warmth and although it is more informative than comedic, I will forgive it and put it in my list because… Well.. It’s Stephen Fry innit? The best bits from his Radio 2 show. His witterings with Maria McErlane are the perfect accompaniment to a basket of ironing (groan – how boring is my life) He often interviews writers, which I always enjoy, and I have got good recommendations for books as well as theatrical shows and TV programmes from this Podcast. Do you listen to podcasts? Which ones do you subscribe to and hate to miss? I want to spread my wings a bit so recommendations wold be lovely.